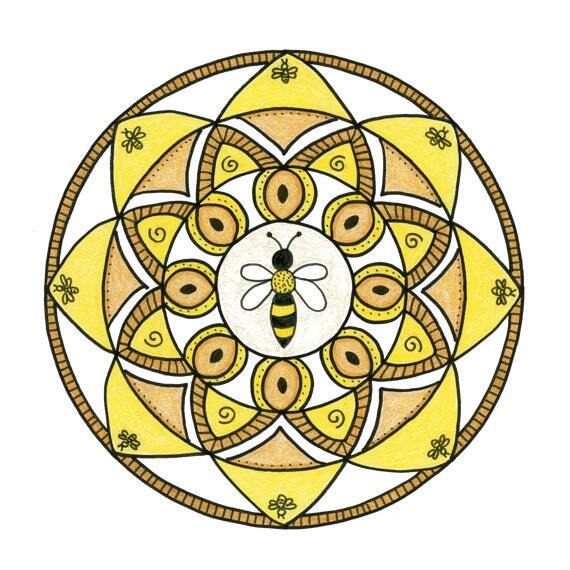 Lovely square notecard featuring a print of an original ink and colored pencil drawing of a mandala honoring the precious honeybee. The size is 5 1/4" x 5 1/4", printed by the artist at her home studio on quality white matte notecard using an Epson Stylus Pro 3880 and archival inks. Comes with matching envelope. The watermark will not appear on the card. Signed and suitable for framing. You can follow Lydia's Drawing Board on Twitter (@LydiaEloff), Facebook (facebook.com/lydiasdrawingboard), and Instagram (http://instagram.com/lydiasdrawingboard)! All original artwork is copyright Lydia A. Eloff and cannot be reproduced without permission. Sale of artwork, print or original, does not transfer the copyright to the buyer. All rights reserved. Just a reminder to South Carolina residents. Please select OTHER when checking out and I will remit an adjusted invoice reflecting sales tax adjustments specific to your shipping address. I am sorry that this delays your transaction. Thank you in advance for your help. I will try to ship your item within 3 - 5 business days. The item will be carefully packaged and shipped using USPS or other ground carrier. © 2011 Lydia A. Eloff. All artwork is subject to copyright and not authorized for use without prior permission. All rights reserved.